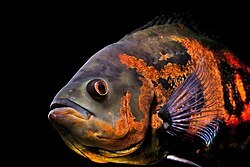 Qarawasu (Astronotus ocellatus) nisqaqa huk challwam, Amarumayu sach'a-sach'a suyupi mayukunapi kawsaq, runap mikhusqan. ↑ Luis Eduardo Luna (1983): The Concept of Plants as Teachers among four Mestizo Shamans of Iquitos, Northeastern Perú. carahuasu (Astronotus ocellatus). Commons nisqaqa multimidya kapuyninkunayuqmi kay hawa: Qarawasu.